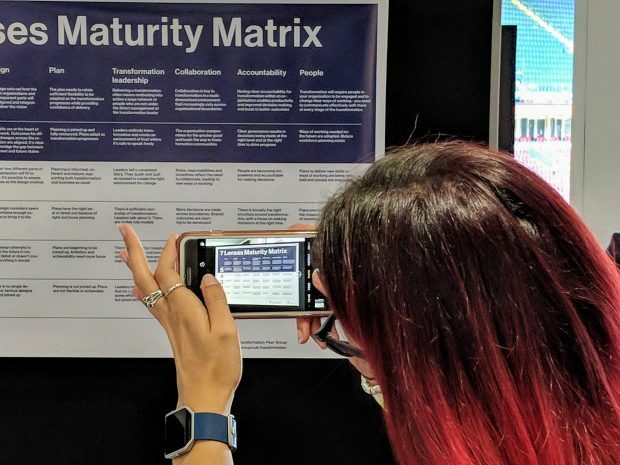 Since the 7 Lenses Maturity Matrix was published at Transforming Together on 25 September, it has been downloaded thousands of times and used by teams across the country. 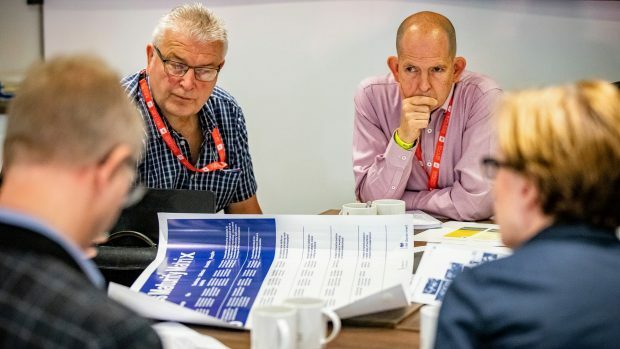 It’s proving to be a really useful tool for people to assess the progress of their transformation, and there is lots of good practice we can learn from. When are people using it? The 7 Lenses Maturity Matrix was developed by a team in the Home Office. It is designed to be a practical tool to help teams reflect on their transformation, have focused discussions, and identify which areas need more attention. There are two main times where using a maturity matrix can really help move things along. The first is when you are starting something new or your transformation is at a pivotal step between phases. At these points, you need to ensure that your team and key stakeholders share the same ambition and sense of challenge for what is coming next. By shaping the right conversation, you can create a single plan of action. The second comes when you are in the middle of delivery and you want to know whether you are on track. Benchmarking your progress using a cross-government tool will give you insight built on the experiences of your peers - and stop you having to reinvent the wheel for a challenge others have already faced. The 7 Lenses of Transformation is a framework to do just this, and the matrix helps to structure the conversation. How are people using it? While these teams used the matrix for slightly different purposes, they all had some key elements in common. Using the matrix is not about what score you end up with; it is about the conversation. To make sure you have the most effective discussion, you need to have the right people with you. Find a date for your whole team to be present. The insights that come out of this can shape your work programme for months to come, so everyone should be involved. 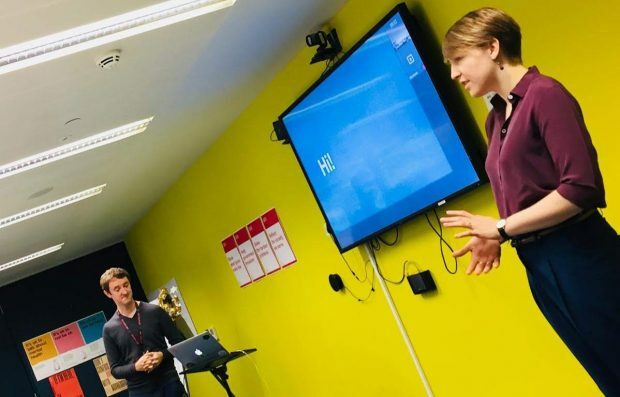 At GDS, the management team took up part of their away day for their exercise, picking the time when the highest number of Senior Civil Servants would be there to join the conversation. Go beyond your immediate team. Nobody can deliver a transformation alone, and whether you are setting the ambition for something new or benchmarking progress, make sure others are in the room with you. Having them as part of the exercise will make the conversation richer. 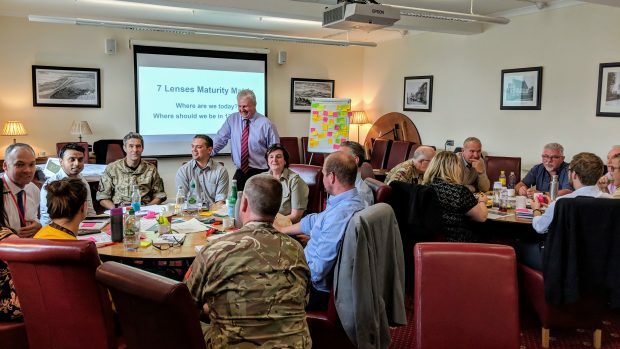 In the MoD, representatives from each of the armed forces were in the room, alongside the transformation team and other key corporate groups. To make the most the maturity matrix, these teams gave a lot of thought to the questions they would answer, the structure of their workshops, and how the rooms were set up. Having a dedicated, external facilitator helps, as everyone should be involved in the discussion and share their views. Facilitation methods can vary; different ones suit different groups. I recommend using Liberating Structures, particularly the ‘1-2-4-all’ method. This is really effective at engaging everyone in the room on a question, and it helps avoid the loudest voice being the only one that is heard. A facilitator should also listen out for conclusions from groups of people that are too unanimous. If you have a range of people in the room, there will be a level of disagreement due to differing viewpoints. This is positive, and it should be welcomed. Raising these differences is a key part to make sure you can reach a common understanding and next steps. These conversations will generate a lot of insight and data. It's important to make time in your session to turn this into usable information and plans everyone can support. The Liberating Structure ‘What? So What? Now What?’ can help you go through this. Should we prioritise one lens above the rest? Is this collective level of ambition realistic for the next 12 months? What do we need from others to progress? What are our biggest risks to moving forward? Do not use this then forget it. With so much input from so many people, make sure you come back to it. If you are starting out, referring back to this framework will help you keep your original ambition in mind. And if you are benchmarking progress, continuing to do so every three or six months will give you a rich picture of your work. Over 2019, we will be publishing more tools, guidance, and examples of good practice on GOV.UK/transformation. 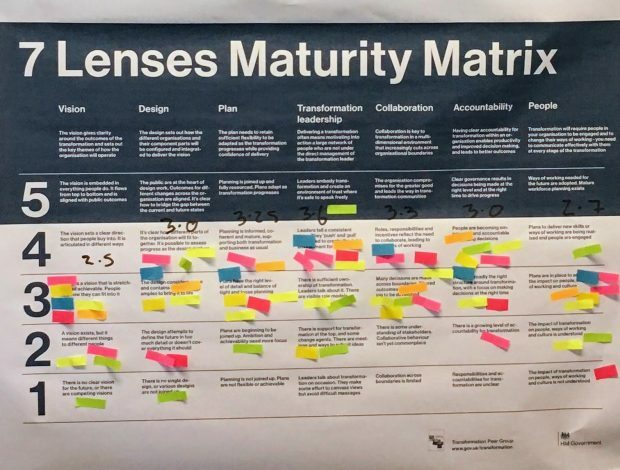 We would love to hear your thoughts about what would help make the 7 Lenses Maturity Matrix better and more effective. I hope you find this and the matrix useful. Please keep downloading it, using it, sharing your stories, and transforming government. For more information check out GOV.UK/transformation, and sign up for blog updates to be kept in the loop when we publish new material. Follow Billy on twitter, or email transformation@ipa.gov.uk if you have any questions; we’ll be happy to help. You can find out more about Liberating Structures by following them on twitter as well.